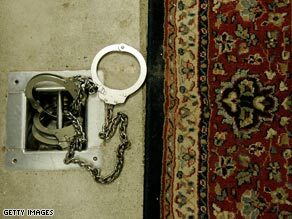 Amnesty International: "Justice appears to be offering a get-out-of-jail-free card"
WASHINGTON (CNN) -- Human rights organizations reacted angrily Thursday to the Obama administration's announcement that CIA officials would not be prosecuted for past waterboarding and other harsh interrogation tactics. Obama administration officials say nobody should be prosecuted for following Bush-era policy. Attorney General Eric Holder made the announcement in a separate statement as the administration announced it was releasing four Bush-era memos on terror interrogations that included the controversial practice of waterboarding. "The president has halted the use of the interrogation techniques described in these opinions, and this administration has made clear from day one that it will not condone torture," Holder said. "We are disclosing these memos consistent with our commitment to the rule of law." The attorney general promised that officials who used the controversial interrogation tactics would be in the clear if their actions were consistent with the legal advice from the Justice Department under which they were operating at the time. Amnesty International said the release of the documents was welcome, but condemned the decision to block prosecutions. "The Department of Justice appears to be offering a get-out-of-jail-free card to individuals who, by U.S. Attorney General Eric Holder's own estimation, were involved in acts of torture," said executive director Larry Cox. "No civilized definition of 'reasonable' behavior can ever encompass acts of torture. Torture has long been recognized to be a violation of both national and international law, and no single legal opinion, no matter from what source, can change that." Time: CIA rebellion over torture memos' release? The Center for Constitutional Rights, a nonprofit agency founded by attorneys who worked for the civil rights movement of the 1960s, also panned the decision not to prosecute. "It is one of the deepest disappointments of this administration that it appears unwilling to uphold the law where crimes have been committed by former officials," the organization said. The center is pushing for prosecutions of high-level officials in the Bush administration. "Whether or not CIA operatives who conducted waterboarding are guaranteed immunity, it is the high-level officials who conceived, justified and ordered the torture program who bear the most responsibility for breaking domestic and international law, and it is they who must be prosecuted," the center said. "Government officials broke very serious laws: For there to be no consequences not only calls our system of justice into question, it leaves the gate open for this to happen again." President Obama said officials involved in the questionable interrogations would not be subject to prosecution because the intelligence community must be provided "with the confidence" it needs to do its job. "This is a time for reflection, not retribution," he said. "I respect the strong views and emotions that these issues evoke. We have been through a dark and painful chapter in our history. But at a time of great challenges and disturbing disunity, nothing will be gained by spending our time and energy laying blame for the past." Amnesty's Cox rejected that argument. "The United States has had plenty of time for reflection -- there is very little information in the newly released material that hadn't leaked out long before," he said. Obama "also said that the United States is a nation of laws. But laws only have meaning if they are enforced. "The United States has laws prohibiting torture, and two-thirds of Americans support an investigation into what has been done in their name. That is not seeking to lay blame; that is a call for justice long overdue." Leon Panetta, Obama's CIA director, told his employees in a memo that he would "strongly oppose any effort to investigate or punish those who followed the guidance of the Department of Justice." "Although this administration has now put into place new policies that CIA is implementing, the fact remains that CIA's detention and interrogation effort was authorized and approved by our government," he said in the memo, a copy of which was obtained by CNN. Panetta added that the CIA would provide legal counsel for any CIA employee who is subjected to an investigation relating to previously authorized policies. "This is an opportunity for CIA to begin a new and great chapter in our history of service to the nation," he said. "You need to be fully confident that as you defend the nation, I will defend you." The American Civil Liberties Union, which had been seeking the memos, called on the Justice Department to release other Bush-era memos regarding interrogations. The group also is seeking the appointment of an independent prosecutor to investigate whether laws were broken by the Bush interrogation policies, as well as who knew about them and who authorized them. Sen. Patrick Leahy, the Vermont Democrat who is chairman of the Senate Judiciary Committee, reiterated that he wants a commission of inquiry to look into the matter. "We must take a thorough accounting of what happened, not to move a partisan agenda, but to own up to what was done in the name of national security, and to learn from it," he said. Obama, who has said he does not want to criminalize policy differences between administrations, has not backed Leahy's call for a commission, which is strongly opposed by Republican lawmakers. The nation's top intelligence officer, former Navy Adm. Dennis Blair, also weighed in on the issue, noting that he "experienced public scorn" for serving as a young officer during the Vietnam years, which he described as "an unpopular war." "Challenging and debating the wisdom and policies linked to wars and war fighting is important and legitimate. However, disrespect for those who serve honorably within legal guidelines is not," he said. "I remember well the pain of those of us who served our country even when the policies we were carrying out were unpopular or could be second-guessed. "We in the intelligence community should not be subjected to similar pain. Let the debate focus on the law and our national security. Let us be thankful that we have public servants who seek to do the difficult work of protecting our country under the explicit assurance that their actions are both necessary and legal."